I don’t remember when I’ve been so excited to show you a project! It is nothing but my trading project which I have done with so much of efforts and time spent. Yes, I`m not an ardent trader but still wanted to have a feel of the trading market with the CryptoCFDTrader and took up a mock trade which explained me how flourishing and profitable this market is. You know I love a good repurpose, and saving stuff from the garbage. This might be one of my all-time favorites! This clock was a curb find several months ago. I tried to do another project with it using some bead board. The bead board was too thick to allow the hands to move freely, so I put the clock parts away. While I was out of town helping Jamie with her deck rebuild, and her benches my friend Marianne scooped this guitar out of the neighbor’s garbage for me. 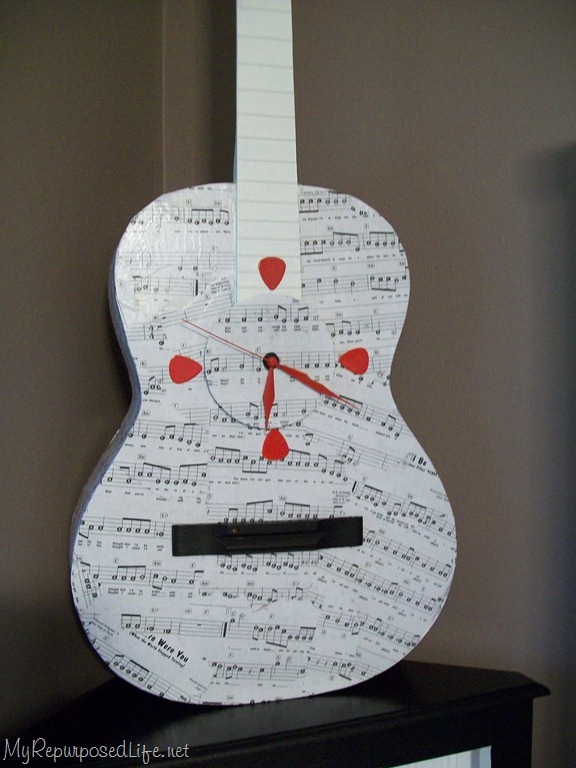 I had planned to make a clock out of the guitar all along. I have always loved clocks of all kinds. I had been looking for a song book to decoupage onto this guitar. Along comes the DIY Club September party, Mod Podge! So it was time to gather all my supplies and get started. I decided to do this project in the house due to the fact that it has been in the 90’s again. While talking to cousin Terry and Jamie about how I was going to work on the guitar, I would refer to the “handle” and the “top part”, etc. I decided to look a picture so that I don’t offend musicians that happen to read my blog. Because the pick guard was raised, I thought it might be difficult to decoupage, so I removed it. I also removed the saddle bridge, not knowing if I would replace it after I decoupage or not. These kids really had abused this poor thing! I always like to prime my projects before I decoupage in case I miss a tiny little spot. My Mod Podge is older than the hills! As you can imagine I don’t have any “in progress” pictures due to the messiness of the project! I was not about to pick up my camera. The sheet music I used came from some Radio Shack song books. I thought they were Jamie’s but she said she doesn’t remember them, so they may have been a curb find. I painted the neck of the guitar Crisp Linen White. I needed something to attach the clock box to and cover up the soundhole. I had been ripping some cd’s to my computer and this little protective piece just happened to be on the coffee table. You can see it is pure brilliance! Sometimes I even amaze myself how I repurpose items! I used a full sheet of the music. I decoupaged it, then after it dried I trimmed the excess off. I rummaged around some of Jamie’s old things to find these guitar picks. She bought these before she even knew she was moving to Nashville. While talking to Jamie on the phone she mentioned that maybe the guitar should have a “pop” of red. I love that I have friends and family to bounce things off of. You know, it just helps to talk through the things that don’t seem to be working. I had planned on painting the picks black, but realized I don’t have any black spray paint. (what kind of DIY’er doesn’t have black spray paint on hand) However I did have some red, so after she mentioned that, I said “great, I have red”. So, red it was! (Thanks sis for giving me all that spray paint last year). I have some 3M products that Regina gave me. They really have come in handy. This double sticky tape is “permanent”. I put two small pieces on the clock works to hold the clock face. I reattached the hands. See how perfect this was for the face! Look closely at the words of the song, Only time. I gave it a dry fit to make sure it was going to work. Then I tested to see where I wanted to put the picks . . . on the clock face? Or on the body of the guitar? I sent these pictures to Jamie to ask her opinion. Because the clock face sat a little higher near the neck than it did on the body, I could afford for it to be lifted slightly. I used another 3M product I got from Regina, sticky Velcro. This way the clock face can be removed to change the battery. To adhere the picks, I turned to the trusted Gorilla Glue. Whoa… you talk about strong QUICK hold! I needed to adjust the bottom pick but, it was too late! It was s-t-u-c-k! voila! My newest clock, made from a trashed guitar! The clock keeps great time! Look at that shape! I wish I looked so good. I painted the head black. I accidently broke the saddle bridge while removing it from the guitar. I used Gorilla Wood Glue to repair it. I clamped it, now it’s good as new. In this picture I have temporarily reattached the saddle bridge. I sort of like the fact that it breaks up the bottom of the body, but not sure if I will attach it permanently or not. I may have put it a little high? Any ideas/thoughts about that? I don’t think I should replace the pick guard, do you? Because once I attach it with Gorilla Glue, it’s NOT going anywhere! I may keep this, if I do, I’m sure I will hang it on the wall. Won’t it look awesome hanging? Total cost of this project? nothing, zero, nada, zilch! I had everything on hand, thanks to my wonderful family and friends!